Mandy has nearly completed my blogs facelift so I thought I would tell you why I made the change. 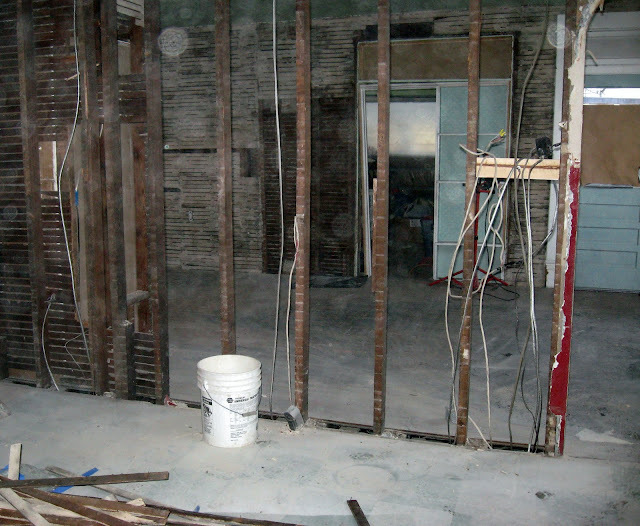 It has now been five years since we first began the renovation of our home. For me, it seems even longer than that! 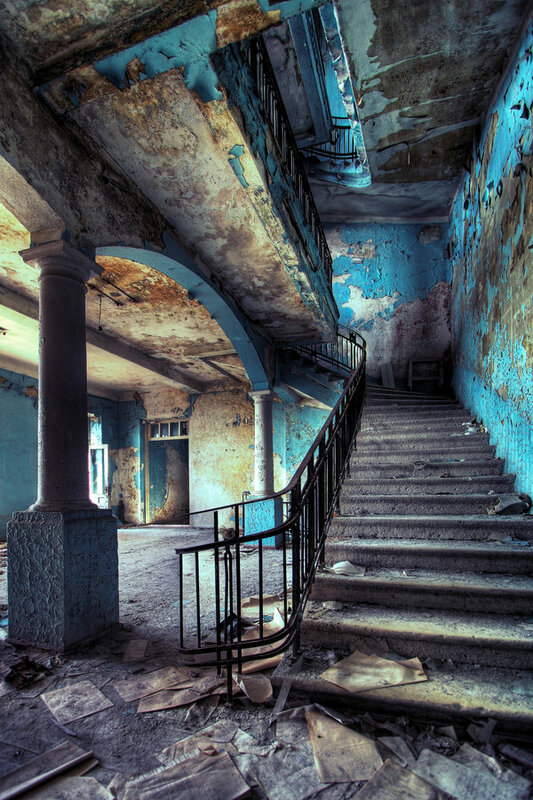 The decay is evident but there is something eerily beautiful about it. You have to look beyond the current state of things to see the beauty...the life of this house. And transformed it into Our Home. And let me say... we are getting close to completion! Really close! Prior to this renovation, our home was always referred to as Nana and Gramps. This is how everyone thought of it. It was in need of severe changes...there was a lot of deterioration. some things needed to be addressed immediately! this is the original house sitting on a limestone then brick foundation. Over the course of 5 years...twice Bill has told me to go outside until a wall was supported. Remember, this house is over 100 years old! And many people have remodeled. Beams were cut that were load bearing. Walls were removed and then not stabilized. The first years were consumed with rewiring of the entire house, new plumbing, heating and air ductwork to the upstairs. New furnace and ground work for central air (the condenser will be added this next Spring.) There is a new water heater, water softener (required in this area). Insulation was installed where none ever existed and all but one window was replaced. That's a whole lot of windows and doors! Believe it or not...this is my utility room! The bucket sink now sits where the commode is in this picture...Hard to imagine! I can't even tell you how much demolition! Would you a like to see a few before and afters? Creating these collages have really helped Bill and I see just how much we have accomplished. Some things are even further along than these pictures show but I haven't taken any pictures in some areas for awhile...it's on my to do list! The first 3 pictures are taken from almost the exact same spot! Sometimes things are just drawn and then created! In some areas..there aren't any before picture available because the room didn't exist! But this gives you some idea! This area is even further along and I will share it soon! 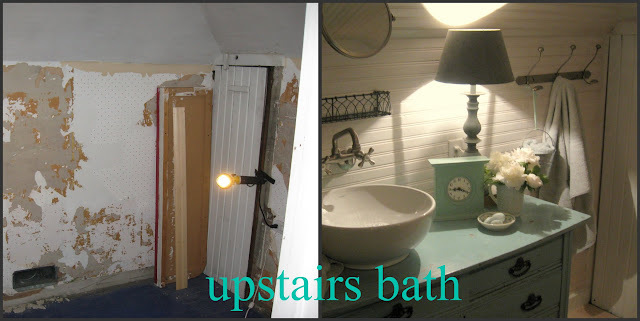 The upstairs bath was actually a little closet! And the closet/Master bedroom...was once our kitchen and part of the back porch! The only thing that remained in the same place...was the door to the closet! It once was the entrance to to back porch! So much has transpired here at home...But just as much has taken place in our lives! Along this path that we were on...We changed. We discovered what was truly important. Our Relationship with the Lord and each other. Don't get me wrong...I want this to be finished more than I care to think about...but I have learned to enjoy the journey. I have reclaimed my life. I have discovered how to find my joy in the little things. My new outlook on life! I have reclaimed the joy that I thought I would never again truly know. I rediscovered that it's the simple things that my children now share are so much apart of who they are as adults. Beautiful changes in every way. It's a perfect title. That laundry room sink area takes my breath away. Amen my dear friend!So glad you are enjoying the journey!& how fun to see how far you have come! I love your new blog name. Thanks for taking us along on your journey. I've enjoyed the ride and am anxious to see what is in store for the future. Gosh Donna I never knew it was your grandparents house. We too have a house that we will eventually remodel that belonged to hubbies grandmother. I think we are on the 20 yr plan....uggh. You have come so far and now your dream is nearly there. What a beautiful journey. Your blog title wraps your joy around your readers. I am blessed to have met you! Beautifully written, Donna! The labor of love is certainly reflected in your gorgeous finished & almost finished spaces. What a Labor Of Love to transform your Family's Beautiful Old Property into something truly special for you and your Family. Sadly, too many Old Homes are lost because either nobody cares, or has the vision or patience to rescue them and restore them. We've only been in our Old House for just over a decade... still lots to do to it, but I Love it and especially it's rich History & that it survived into the 21st Century in spite of years of laying in waste & neglect & enduring vandalism before we saved it. 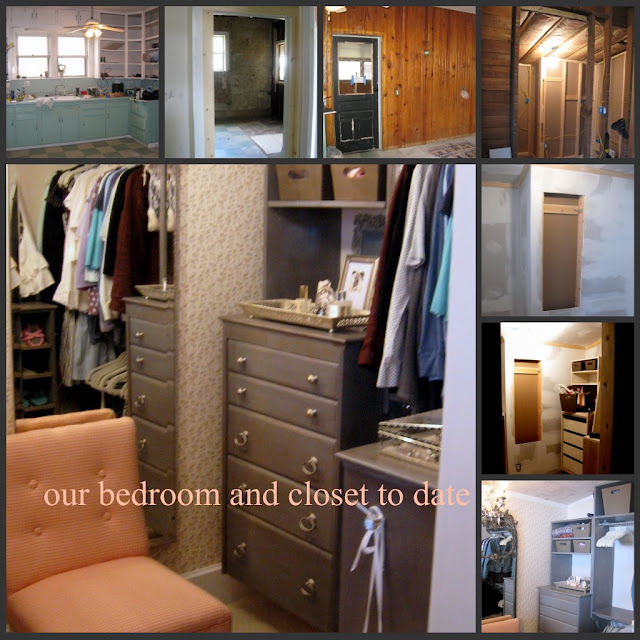 I enjoy reading your blog--we share may things in common (love for old houses and things "reclaimed") but you definitely surpass me in your ability to accomplish tasks! You should be very proud of all you have achieved. All of your work has paid off - your home is beautiful. Congratulations on a job lovingly done. You have done amazing job on making Nana and Gramps old place your wonderful new home...and I loved reading how blessed the journey has been for your families growth...Though I am sure sometimes you all experienced some growing pains...but it always wonderful to be able to look back and see it was all worth it. Your Utility bucket sink area is inspired...and truly captures the heart of an old home...I adore your bedroom and upstairs bath also. Can't wait to see the rest of your spaces completed. What a wonderful restoration project, created in love and with the love of God surrounding you. Oh to enjoy the journey each and every day, instead of wishing this or that. Right on Donna! It is the ones that surround you, not your surroundings that are most important. Creating beauty where ever you are is just the thing that some us need to do to feel peaceful and joyful as we make any space into a home for the ones we love. I love coming here and seeing all of your projects....you too inspire me my dear!! How amazing to be able to live "in" your family's history! What a lot of work it has been...but the rewards appear to be quite awesome! What an amazing journey you have traveled. Your description of how life has changed is very telling...how important the little joys are and how important family is. Your home is truly a labor of love and reflects your loving dedication. Before starting any work, perfect job to graph it. Doing best in home is very hard, but for you it does 't seem hard. You covered old memories also. I'm very happy for you. Some people never get to the point you are in life. It's all about family, enjoying that first cup of coffee in the morning and being aware of the holy spirit in all of us. Life's not easy but if it was maybe we wouldn't appreciate all the joy that is there if you take the time to notice. You have no idea how much I learned about you reading this post Donna. I learned that you have a heart of gold and that you have the patience of Job. Qualities that make a truly beautiful woman. It was awesome to see how far you have come with the house. It is going to be a beautiful home for you and your dreams.